What was the common factor in Jeetendra-starrer Humjoli and Amitabh Bachchan-Vinod Khanna’s Parvarish in the 1970s? It was ‘kali ghodi’, the Yezdi motorbike, from the mesmerising track ‘Kali Ghodi Dwar Khadi’ in Farooq Shaikh-starrer Chashme Buddoor (1981). ‘Kali ghodi’ was among the country’s favourite motorbikes in the 70s and the 80s. 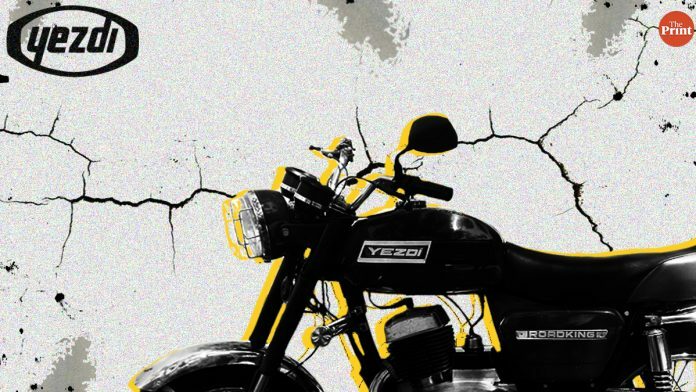 Known for its raw, roaring sound, Yezdi was a shiny, rugged motorbike with a 250cc engine in line with its other two rivals, Rajdoot and Bullet. Jawa motorcycles were sold in India until 1973 when the company began producing bikes under the new name, Yezdi. Its punchline — Forever Bike, Forever Value — set the narrative and began to be marketed as a symbol of reliability and resilience. The bike nurtured India’s connection with the racing and rally circuits. Several bike owners and motorbike technicians joined hands and customised their Yezdis for the racing arena. Veteran motocross racers C. K. Chinnappa, Jagadeeswara Reddy, Thirumal Roy, Rustom Hormuzdi and Anita Nanjappa won several races on Yezdi. Yezdi motorbikes remain popular among motorcycle enthusiasts and many bikers run a group on social media platforms where they share their trekking and racing experiences. Despite being out of production for 22 years, bikers celebrate Yezdi Day on the second Sunday every July. The motorbike was associated with the Czech Republic’s JAWA motorcycles — the sweethearts of the motorbike rallies in the Europe. These bikes were exported to more than 100 countries. “The Czech bikes have an illustrious place in the sport’s history and were invincible. The Yezdi was a beautiful Indianisation of the JAWA built to greater standards of ruggedness and last forever,” Yezdi’s description reads on the company’s website. Following the increasing demand for Jawa bikes in India, the company established a factory in Mysore in 1961. For the next decade, Ideal Jawa Pvt Ltd manufactured the 250 type, after which the company began manufacturing the bikes under a new name ‘Yezdi’. The company was liquidated in 1996 following labour disputes and rising debts. To this day, Yezdi remains embroiled in legal trouble with no end to its financial woes in sight. The brand is registered at present for use in leather goods but the valuation of its trademark will run into crores, according to a report.